This book teaches you the five traits every successful developer should possess, gives tips on how to improve your overall marketability, teaches you how to write an effective resume, and prepares you for a technical interview. It will tell you the tidbits of information that developers usually don’t discover until many years into their careers. The kit includes a 200+ page eBook (PDF) that teaches you how to get the job you want (and will make you a better developer in the process). 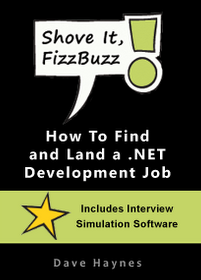 It contains tips on improving your overall developer marketability, 110+ technical questions (with answers), plus general interview questions, puzzle questions, and more. The kit also includes software that simulates an actual interview and can help boost your confidence during the real thing. You could also just use the software to keep yourself on top of the latest technologies. Last, but not least, the kit includes a customizable resume (in Word format) that has proven to be effective at getting people jobs. College students who know a lot of theoretical stuff, but don't know how to actually get a job, or what a real job will require. Junior developers who want to know how to get to the next level in their development careers. Mid to Senior developers who just want to stay sharp and be more marketable.